Some of the characters are likeable and funny, but the story’s a dud and the musical performances are only occasionally entertaining. It says something pretty sad about America that a movie like this could be so popular that its spawns a sequel. Maybe it’s just the youth of America, brought up on shows like Glee, that can’t get enough of this sort of thing. But what we have here is a movie that is not very intelligent at all. This is the film about a new girl in college who thinks she is better than everyone, and doesn’t even want to go to college to begin with. That girl is Becca, (Anna Kendrick,) and she joins up with an all-girls acapella club, practicing and performing songs from the past. There is some comedy that works here, but most of it doesn’t. And the storyline is both dopey and predictable. What does work are some of the characters. There’s the charming boyfriend and the comic relief heavier girl (who goes by the name Fat Amy.) Some of the performances are okay, but in a movie like this, you would expect them to be great. They aren’t. There are lots of problems with this movie, and it’s a shame, because you can see where this might have been something good. If only the story or humor had been more intelligent. Pitch Perfect is not a very good movie. It’s a film made for the young crowd that eats shows like Glee up with a spoon every week, simply because of the combination of familiar music and teenage level comedy. The movie features the same sort of thing. That is to say the plot is predictable and kind of dumb, and even the musical performances are adequate at best. The humor is at a pretty low level here, and one of the only decent things about the movie is the characters. Not all of them, but some. Mainly some of the side characters. Considering that this is all the movie has that actually works, it is not a whole lot, and certainly not an enjoyable experience, getting through this debacle. Now, the movie isn’t terrible, or anything like that. It’s just not very good, either. It’s about a girl named Becca (Anna Kendrick,) who comes to college for the first time and is the rebel who thinks she is smarter and cooler than everyone and everything. She even thinks she is smarter than college, and sees no point of going there. The only reason Becca goes is because he dad is a professor, and so gets her in for a reduced tuition amount, and makes her a deal. The deal is that if Becca gives it a shot for a few years, and still doesn’t like it, than he will help her move to California to become a music producer. So far, this thing isn’t off to a very good start. Considering how against college Becca is, I would have preferred that she was a stoner or a dead-beat or something. But here, she is the smartest character in the film, and yet somehow doesn’t see the benefit of going to college, even when it is basically free. While some of the characters in this movie are fun, Becca is definitely not one of them. It seems like, in these sorts of female-driven comedies, the lead has to always be the smartest and most stuck-up one of the bunch. For some reason she just can’t be the charming one. It’s the boyfriend of the movie who automatically gets that role. Maybe that has to do with who the target audience is. Clearly the target audience of this movie is women, and the film makes no attempt to hide that. If it had been a more gender-free movie, maybe the lead could have been a nice and attractive girl, who was maybe even a little innocent and naive, (think Kristen Dunst’s character, Torrance, in Bring It On.) Only in today’s and age, the female lead has to be the rebellious, feminist type who can do whatever she wants and is held back by nothing. This character is written in such a ridiculous way that one of her key traits is that she never watches movies. She just can’t sit through how long they are, and plus she considers them all to be predictable. While I don’t like this character idea, at least the movie finds a cool example to use, when explaining it, showing how Becca figured out the secret relationship between Luke Skywalker and Darth Vader, long before she ever saw Star Wars. While we follow Becca on her journey at the school, and meet her quiet Asian roommate who wants nothing to do with her, we also meet the guy who will inevitably become her love interest. This is Jesse, (Skylar Astin.) He is as charming and cute and funny as they come. There isn’t a mean bone in this guy’s body, but at the same time, he is far from sweet and innocent. He’s more of the sarcastic, wise-cracking type. And like Becca, Jesse also has a stange roommate. For him, it’s a guy who is wearing a magicians cape and pulling off magic tricks when Jesse first walks into the room to meet him. Now, to be fair, there are certainly strange college roommates out there, but they don’t ever make it this obvious, from the very first second. Talk about begging for laughs, and not getting them, this movie is throwing out the weirdos card way too early in the game. At that brings us to the auditions. There’s a scene that proceeds it where Becca is singing in the shower and another girl hears her and convinces her to come to tryouts. That scene exists for one joke, that the girls are naked in the showers when this occurs. Other than that, it’s simply the girls singing and discussing try outs. And then it is audition time, and you better believe we get a whole can of weirdos there. Now, most movies about trying out for any sort of team, (especially a singing or dancing one,) features a bunch of weirdos trying out. That’s practically a staple of the genre. The only problem here is that every one of these weirdos, who you would think would have no chance in the world of making it, actually does. I mean the girls making the judgements are literally rolling their eyes and laughing at some of these girls, and then they hire them all anyway. When they hire a girl for the team who says things that you can’t even hear, you know the movie is not even trying. It’s just being stupid to be stupid at that point. Luckily Becca, (who is one of the leatst likeable characters in the film, despite being the lead,) is surrounded by some more interesting characters. Not only is there Jesse, who just completely wins you over right away, but then there’s also Fat Amy (Rebel Wilson )and Bumper, (Adam Devine.) These two are the comic relief. Especially Fat Amy, who calls herself that so that other girls won’t do it behind her back. Now, I’m not saying she’s hilarious or anything, because she’s certainly not, but some of the only real jokes come from her. The other ones probably all come from Devine, who plays the enemy and couldn’t care less about being nice or honorable. There are a small handful of funny moments in the film, including a throwing up on the audience beginning, and a moment where the girls are singing so poorly at a party that one of the guys says they are making the beer start to taste bad. But that’s about it. Most of the jokes here definitely fall flat. That includes an ending that not only brings back the throw-up beginning, but takes it to a level where it becomes both idiotic and disgusting. I mean, the Asian girl, who doesn’t speak, is actually making snow angels while lying in a mound of vomit. Yep, that’s the kind of movie this is and humor level it has going for it. The storyline is incredibly predictable, with the team that Becca joins only wanting to do old, tired numbers, and Becca having the revolutionary idea that they should do new stuff. Wonder which option they will end up choosing in the end. Of course in order to get there we have to listen to the girls sing the Ace of Base song “I Saw The Sign,” about four times. And here’s the thing, with a movie like that, at the very least, the music should be great. It isn’t. It’s okay. I would say the musical numbers have about a fifty-fifty batting average. In the first half, some of the songs by the guys group are good, and then once in a while, one of the girls songs is okay. I do like what they do with their final song, bringiing in an 80s movie reference from earlier in this film. But most of the musical numbers are far from anything special, and that includes a scene at a Riff Off, where everyone meets in the flood control channels to play a game where people can start singining and then get interrupted by other people who break out in song. Some of these songs are okay, some are not, much like the overall situation with the musical numbers in the movie. 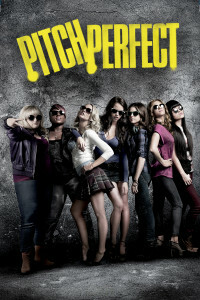 There are lots of problems with Pitch Perfect. We see Becca at work, for example, because that’s where she meets the romantic interest character, but we never once see her in classes. That’s because the movie picks and chooses what it wants, and does a pretty poor job with its selection. A much better comedy about college life is 22 Jump Street. This one is meant to be a simple-minded (no pun intended, if you see the movie and get the reference,) romantic comedy, complete with a paint by the numbers plot. Do you think things will end up working out for the nice, innocent magician roommate with a heart of gold, who was never allowed to be a member of the team, for example? There are definitely some things about the movie that work, including some of the musical numbers and a small amount of jokes. But for everything that does work, there is a hell of a lot more that doesn’t. Take Fat Amy getting cake thrown at her and joking around about how she’s been shot. I’m pretty sure she would be crying, but this movie wants to make a stupid metaphor out of it. The intelligence level isn’t very high here and that really hurts the film.